The pitch shall always be uncovered to allow for optimum acoustics. To ensure competition, alternative facilities must be available, with a covered playing surface of similar characteristics, in case of adverse weather conditions beyond the control of the Organising Committee – persistent rain, strong winds, etc. This playing surface may also have a wooden, synthetic rubber or similar surface. The alternative facilities must be inspected and approved by the IBSA Technical Delegate and the Organising Committee prior to the start of competition. The IBSA Technical Delegate and the Organising Committee shall ensure that the floodlighting of the pitch is suitable for games played at night. The pitch must be rectangular. The length of the touch line must be greater than the length of the goal line. The pitch is marked with lines, which belong to the areas of which they are boundaries. The two longer boundary lines are called touch lines. These touchlines shall be formed with kickboards that cover the entire length of the touch lines and extend one metre beyond both goal lines on both sides of the pitch. The kickboards shall be between one metre and one metre twenty centimetres high and shall be angled at no more than 10 degrees away from the pitch. The two shorter lines are called goal lines. All lines are 8 centimetres wide. The pitch is divided into two halves by the halfway line. The centre mark is indicated at the midpoint of the halfway line. A circle with a radius of 3 metres is marked around it. * At a distance of 12 metres from the goal lines a dotted line shall be marked parallel to the goal lines from one side of the pitch to the other (see diagram above). Quarter circles, with a six-metre radius, are drawn centred on the outside of each goal post.The quarter circles are drawn from the goal line, towards the nearer of the kickboards, to meet two imaginary lines six metres in length drawn at right angles to the goal line from the outside of the goal post. The upper part of each quarter circle is joined by a 3.16-metre line running parallel to the goal line between the goal posts. A distance of one metre shall be measured from the outside of both goalposts and in the direction of the nearer of the two kickboards. Two lines measuring two metres shall be marked perpendicular to the goal line and towards the half-way line at this distance. These two lines shall be joined by a 5.16-metre long line running parallel to the goal line. This area shall be called the Goalkeeper’s Area. A penalty spot is drawn 6m from the midpoint between the goalposts and equidistant from them. A second penalty spot is drawn on the pitch 8 metres from the midpoint between the goal posts and equidistant from them. An area behind each goal shall be kept free of any obstacles to allow guides to perform their task correctly. At the point where the kickboard and the goal lines meet, and in the direction of the goal, a line eight centimetres wide and measuring twenty centimetres shall be drawn from the goal line towards the halfway line. Substitutions may be made through a door in the kickboard located in front of the timekeeper’s table or, if no such opening is available, on the goal line of the team that is making the substitution. The goals must be white and they must be placed at the centre of each goal line. They consist of two upright posts equidistant from each corner and joined at the top by a horizontal crossbar. The distance (inside measurement) between the posts is three metres and the distance from the lower edge of the crossbar to the ground is two metres. Both goal posts and the crossbar have the same width and depth of 8cm. Nets, made of hemp, jute or nylon, are attached to the posts and crossbar behind the goals. The lower part is supported by curved bars or another form of adequate support. The depth of the goal, described as the distance from the inside edge of the goal posts towards the outside of the pitch, is at least 80 centimetres at the top and 100 centimetres at ground level. The goals may be portable but they must be anchored securely to the ground during play. The playing surface shall be made of cement, grass or artificial grass. It shall be smooth, flat and non-abrasive. Concrete or tarmac should be avoided. Decision 1 In the event that the goal lines measure between 15 and 16 metres, the radius of the penalty area quarter circle shall measure four metres. In this case, the penalty spot is no longer situated on the line defining the penalty area but remains at a distance of six metres from the midpoint between the goal posts and equidistant from them. • The sound system employed shall be located inside the ball to enable to the ball to run, roll and bounce in a regular manner. In order to guarantee the safety of the players at all times, the system used shall ensure that the ball makes a noise when it is spinning on its own axis or spinning through the air. where the first ball became defective. • It is not necessary to stop play. way that it begins to make a noise again. • The match is restarted according to the Laws of the Game. IBSA member organisations, official IBSA balls shall be used. shall also act as a guide (Functions: see appendix 2). guide, one coach, one assistant coach and one doctor or physiotherapist. has been replaced may return to the pitch as a substitute for another player. • Play shall be stopped. number of the player entering the field of play. the field of play by the referee. whom he is replacing ceases to be an active player. the place where the ball was situated when the game was stopped. ball was when play was stopped. physiotherapist of the goalkeeper involved should the former not be present. but may remain on the team’s substitute bench. to the rules of the game, but may not remain on the team’s substitute bench. his teammates, the captain must wear an armband on one of his arms. captain leaves the facilities or is sent off. himself or another player, including any kind of jewellery. similar material. Footwear must be worn. Each match is controlled by a referee, who has full authority to enforce the Laws of the Game in connection with the match for which he has been appointed, from the moment he enters the premises where the pitch is situated until he leaves. The decisions of the referee regarding play are final. If the referee and the second referee both signal a foul simultaneously and there is a disagreement as to which team is to be penalised, the referee’s decision shall prevail. Both the referee and the second referee have the right to caution or send off a player, but in the case of a disagreement between them, the referee’s decision shall prevail. A second referee is appointed to operate on the opposite side of the pitch to the referee. He is also permitted to use a whistle. The second referee helps the referee to control the match in accordance with the Laws of the Game. Keeps a check on the five minute period following the sending off of one or more players, should the timekeeper not be present. Keeps a check on the time during time-outs, should no timekeeper be available. In the event of undue interference or improper conduct, the referee will relieve the second referee of his duties, arrange for his replacement and submit a report to the appropriate authorities in accordance with the manner and timelines set out in the IBSA competition regulations in this respect. A second referee must officiate during all international matches. A timekeeper, a speaker and a third referee are appointed. They are seated outside the pitch at the halfway line on the same side as the substitutes’ benches. The timekeeper shall be equipped with a suitable clock (chronometer) and the necessary equipment to indicate accumulated fouls, to be supplied by the association or club on whose pitch the match is being played. * – stopping the clock (chronometer) only during time-outs, referees’ time- outs, when a player is being treated for injury, substitutions, when a penalty or double penalty is being taken and when a goal has been scored. He shall restart the clock (chronometer) when the ball is in play. ensures the public remains silent through the use of the public address system. In the event of undue interference by the timekeeper, the referee will relieve him of his duties, arrange for his replacement and submit a report to the appropriate authorities in accordance with the manner and timelines set out in the IBSA competition regulations in this respect. have the authority to inform the referee or the second referee of any improper conduct by anyone on the substitutes’ benches. In the event of undue interference by the third referee, the referee will relieve him of his duties, arrange for his replacement and submit a report to the appropriate authorities in accordance with the manner and timelines set out in the IBSA competition regulations in this respect. shall be used, at all times, to indicate that play is stopped and to inform of all incidents during the match (fouls, substitutions, time-outs and any other situation that may occur during the match, including substitutions made during time-outs or during half-time. The speaker must use the PA system to announce such incidents. shall be used to ask the public to remain silent in accordance with instructions given by the match officials. For international matches, the use of a timekeeper, a third referee and a public address system is compulsory. The timekeeping is undertaken by a timekeeper, whose duties are defined in Law 7. The duration of either half shall be prolonged to enable a penalty kick or double penalty kick to be taken. a team that does not request a time-out in the first half of the match is still entitled to only one time-out during the second half. The half-time interval must not exceed 10 minutes. If a timekeeper is not available, the coach may make a request for a time-out to the referee. If the rules of the competition stipulate that extra time is to be played at the end of normal time, there is no time-out during extra time, except if one of the teams has not requested its time-out in the second half, in which case it is entitled to it during extra time. kick-off to start the match. The team that wins the toss takes the kick-off to start the second half of the match. At the start of the second half of the match, the teams change ends and attack the opposite goals. Substitutes and team officials shall use the substitutes’ bench on the half of the field of play which their team is defending. at the start of each period of extra time, where applicable. A goal may be scored directly from the kick-off. All players are in their own half of the field. The opponents of the team taking the kick-off are at least three metres from the ball until it is in play. The ball is stationary on the centre mark. The referee gives a signal. The ball is in play when it is kicked and moves forward. The kicker may not touch the ball a second time until it has touched another player. indirect free kick shall be taken from the edge of the penalty area and from the point nearest the place where the infringement was committed. A dropped ball is a way of restarting the match after a temporary stoppage that becomes necessary while the ball is in play and provided that immediately preceding the stoppage, it has not passed over the kickboards or goal line, for any reason not mentioned elsewhere in the Laws of the Game. The referee drops the ball at the place where it was located when play was stopped, except if it was located inside the penalty area, in which case the ball shall be dropped on the edge of the penalty area at the point nearest the place where it was located when play was stopped. The ball shall be in play when it makes contact with the ground. if the ball leaves the pitch after it makes contact with the ground, without a player touching it. it rebounds off one of the kickboards and remains on the field of play. When a match is played on an indoor pitch and the ball accidentally hits the ceiling, the game is restarted with a kick-in, awarded to the opponents of the team that last touched the ball. The kick-in is taken from a point on the touch line nearest to the place below which the ball hit the ceiling. A goal is scored when the whole of the ball passes over the goal line, between the goalposts and under the crossbar, unless it has been thrown, carried or intentionally propelled by the hand or arm by a player of the attacking team, the goalkeeper included, and provided the team scoring the goal has not infringed any other laws of the game in the play leading up to the goal. The team that scores the greater number of goals during a match is the winner. If both teams score an equal number of goals or if no goals are scored, the match is drawn. For matches ending in a draw, competition regulations may state provisions involving extra time or alternative methods to determine the winner of a match. Any player who commits five personal fouls during a match must leave the field of play. He may be substituted immediately by another player but is not permitted to return to the field of play during that match. plays the ball, tackles or seeks the ball with his head down. commits any other type of offence not previously mentioned in Law 12 and for which play must be stopped to caution or send off a player. A penalty kick is awarded against a team that commits any of the abovementioned offences inside its own penalty area and while the ball is in play, regardless of the position of the ball. A penalty kick is also awarded if the goalkeeper plays or interferes with play outside the goalkeepers’ area. he touches or controls the ball with his hands or feet for more than four seconds. * commits any other type of infringement not previously mentioned in Law 12 and for which play must be stopped to caution or send off a player. The indirect free kick is taken from the place where the infringement occurred, except if the ball was in the penalty area when the offence was committed, in which case the ball shall be placed on the edge of the penalty area at the nearest point to the place where the ball was located when play was stopped. an indirect free kick is awarded to the opposing team, to be taken from any position on the half-way line. he deliberately leaves the pitch without the referees’ permission. If any of these offences is committed the referee awards an indirect free kick to the opposing team, to be taken from the position where the offence occurred, except if the offence occurs in the penalty area, in which case the ball shall be placed on the edge of the penalty area at the nearest point to the place where the ball was located when play was stopped. The referee cautions the player unless a more serious infringement of the Laws of the Game has occurred. he receives a second caution in the same match. If play is stopped due to the sending-off of a player who has committed any of the abovementioned offences, the referee shall award an indirect free-kick to the opposing team, to be taken from the position where the offence occurred, except if the offence occurs in the penalty area, in which case the ball shall be placed on the edge of the penalty area at the nearest point to the place where the ball was located when play was stopped. The referee sends off the player unless a more serious infringement of the Laws of the Game has occurred. If play is stopped due to any of the offences mentioned above, the referee shall award a direct free-kick to the opposing team, to be taken from the position where the ball was when the offence occurred. if the team scoring the goal is the one with fewer players, the game continues without changing the number of players. For both direct and indirect free kicks, the ball must be stationary when the kick is taken and the kicker may not touch the ball a second time until it has touched another player. If a direct free kick is kicked directly into the opponents’ goal, a goal is awarded. A goal may be scored only if the ball touches another player before it enters the goal. All opponents must be at least five metres from the ball until it is in play. * The ball is in play when it has been kicked and has moved. If a free kick is given against an attacking player in the goalkeeper’s area, the free kick shall be taken by any player from the defending team and from anywhere in the goalkeeper’s area. occurs in the penalty area, in which case the ball shall be placed on the edge of the penalty area at the nearest point to the place where the ball was located when play was stopped. the referee awards an indirect free kick to the opposing team. above his head. He keeps his arm in that position until the kick has been taken and the ball has touched another player or goes out of play. Are those punished by a direct free kick mentioned in Law 12. The first 3 (three) accumulated fouls committed by each team during each half are recorded in the match report. a goal may be scored directly in the opponents’ goal from this free kick. 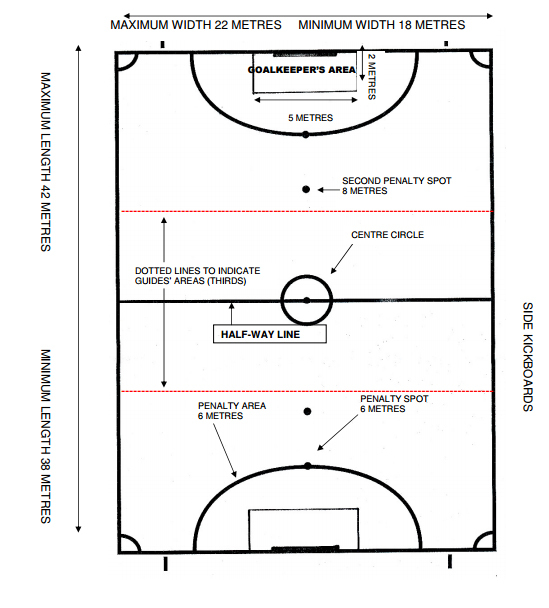 all the other players on the pitch must remain behind an imaginary line that is level with the ball and parallel to the goal line, and outside the penalty area. They must be five metres from the ball and may not obstruct the player taking the free kick. No player may cross this imaginary line until the ball has been touched or played. 8 metres from the goal line, the free kick is taken from this second penalty mark. The second penalty mark is described in Law 1.
if there is extra time, all accumulated fouls committed during the second half of the match shall be carried over to extra time. Additional time must be allowed for a direct free kick to be taken after the fourth accumulated foul at the end of each half or at the end of each period of extra time. an indirect free kick is awarded to the opposing team, to be taken from the place where the infringement occurred, except if the offence occurs in the penalty area, in which case the ball shall be placed on the edge of the penalty area at the nearest point to the place where the ball was located when play was stopped. A penalty kick is awarded against a team that commits any of the offences for which a direct free kick is awarded, regardless of whether it be accumulative or personal, inside its own penalty area and while the ball is in play. Additional time is allowed for a penalty kick to be taken at the end of each half or at the end of each period of extra time. is placed on the penalty spot. stays on his goal line, facing the kicker and between the goalposts until the ball has been kicked. at least five metres from the penalty spot. The player taking the penalty kicks the ball forward. He may not play the ball a second time until it has touched another player. The ball touches either or both of the goalposts, or the crossbar or the goalkeeper. If a goal is not scored, the penalty kick is retaken. If a goal is scored, the penalty kick is not retaken. If a goal is scored, the penalty kick is retaken. If a goal is not scored, the penalty kick is not retaken. A kick-in is a method of restarting play. to the opponents of the player who last touched the ball. may be kicked back into play in any direction. must be at least five metres from the place where the kick-in is taken. The player taking the kick-in must do so within four seconds of the referee’s instructions to do so. The player taking the kick-in may not play the ball a second time until it has touched another player. The ball is in play immediately after it has been kicked or touched. The player taking the kick-in plays the ball a second time before it has touched another player. The indirect free kick is taken from the place where the infringement occurred, except if the offence occurs in the penalty area, in which case the ball shall be placed on the edge of the penalty area at the nearest point to the place where the ball was located when play was stopped. The kick-in is taken incorrectly. The kick-in is taken from a position other than the place where the ball passed over the kickboard. The kick-in is not carried out within four seconds of the referee indicating it must be taken. Any other infringement of the Law occurs. A goal clearance is a method of restarting play. It must always be performed by the goalkeeper inside his goalkeeper’s area. The whole of the ball, having last touched a player of the attacking team, passes over the goal line, either on the ground or in the air, and a goal is not scored in accordance with Law 11. The ball is thrown from any point within the penalty area by the goalkeeper of the defending team. The goalkeeper may not touch the ball again until it has touched another player. * The goalkeeper may not touch the ball again for a second time until it has been played by an opponent or is returned to him by any of his team-mates having first crossed the half-way line. The goal clearance is retaken. An indirect free kick is awarded to the opposing team, to be taken from the penalty area line from the place nearest to where the infringement occurred. An indirect free kick is awarded to the opposing team, to be taken from any point on the half-way line. air, and a goal is not scored in accordance with Law 11. The ball is placed inside the corner arc at the nearest corner. The opponents shall remain at least five metres from the ball until it is in play. The ball is kicked by a player from the attacking team. * The ball is in play after it has been kicked and has moved. The player taking the corner kick may not play the ball a second time until it has touched another player. The player taking the corner kick plays the ball a second time before it has touched another player. The indirect free kick is taken from the place where the infringement occurred. The corner kick is not carried out within four seconds of the referee indicating it must be taken. The indirect free kick is taken from the corner arc. The corner kick is retaken. Taking kicks from the penalty mark is a method of determining the winning team where competition rules require there to be a winning team after a match has been drawn. The referee chooses the goal where the penalty kicks will be taken. * The referee shall toss a coin and the team whose captain wins the toss shall decide if it wishes to take the first or the second penalty kick. Subject to the conditions explained below, both teams take 3 (three) kicks. The captains or the coaches shall inform the referee of the names and numbers of the 3 (three) players who shall take the penalty kicks. These names and numbers must be on the eight-player team sheet handed over prior to the match. When a team finishes the match with a greater number of players than its opponents, it shall reduce its numbers to equate with those of its opponents and inform the referee of the name and number of each player excluded. If, before both teams have taken their 3 (three) penalty kicks, one has scored more goals than the other could score, even if it were to complete its 3 (three) kicks, no more kicks are taken. If both teams score the same number of goals, or have not scored any goals, kicks continue to be taken in the same order until one team has scored a goal more than the other from the same number of kicks. Additional penalty kicks must be taken by players who did not take one of the first 3 (three) kicks. After all players have taken a kick, the first players to take penalty kicks shall continue to take them in the same order. A player who has been sent off or disqualified as a result of the accumulation of personal fouls shall not be entitled to take a penalty kick. The goalkeeper may not be substituted, except in the case of injury and when checked by the referee and confirmed by the tournament doctor, or team doctor or physiotherapist should the former not be available. All players and guides shall remain on the field of play when kicks from the penalty mark are being taken, in the opposite half of the pitch to that being used for the penalty kicks. The second referee shall ensure they remain in that half of the pitch. The goalkeeper whose team-mate is taking the penalty and the guide of the opposing team must remain on the field of play, behind the penalty spot and close to one of the kickboards. 1.1 The public address system must be placed on or close to the timekeeper’s table. It shall be used to give information constantly, provided play is stopped, on all incidents, occurrences and changes that take place during the match. In addition, it shall be used to give the referee’s decisions verbally. 1.2 It shall be used to ask the public to remain silent, in accordance with instructions given by the match officials. The field of play must have a safety zone, of no less than 3 metres wide, around all four sides of the field, free of all architectural or structural obstacles. Where this zone is smaller than stipulated above, safety measures must be taken in order to protect the players. The guides shall perform their duties in a DISCREET and RESPONSIBLE manner, without adversely affecting the performance of the players. The coach shall be positioned at his team’s substitutes’ bench. From this position he can direct his players. The area used for this purpose – the most appropriate – is the central third of the Field of Play. He shall remain behind the opponents’ goal in order to guide the attacking players of his team. The area used for this purpose – the most appropriate – is the final third of the Field of Play, that is to say the third of the field of play closest to the goal his team is attacking. He must not enter the field of play when performing his duties and is, under no circumstances, authorised to address the referee to protest against his decisions. He may indicate audibly the position of the goalposts before a shot is taken with the ball stationary. The Goalkeeper Guide shall guide his team in the first third of the Field of Play, that is to say the third of the field of play closest to the goal is team is defending. At the discretion of the referees, he may, whenever the ball is stationary, guide and orientate his colleagues when free kicks, penalties or double penalties are being taken, as well as organise the wall and situate the players when a shot is to be taken at his goal. He may only do this in the first third of the field of play. The principal duty of the referees is to enable the participating teams to play FUTSAL FOR THE BLIND in a manner that proves worth watching, while ensuring the players obey the laws of the game. 4.1 Referees officiating at official IBSA-sanctioned competitions must belong to the IBSA Futsal International Referees Pool. The use of coloured cards to indicate punishment (yellow – caution, red – sending-off) is an effective preventative measure in the field of sport and is aimed at avoiding violent behaviour, both individually and collectively. Can a match be placed on a grass pitch or an artificial grass pitch? Yes, as long as the playing surface has been approved by the IBSA Technical Delegate. Where should the substitutes’ bench be? The substitutes’ bench should be placed off the field of play and on the same side of the pitch as the timekeeper’s table. Substitutes and team officials will always use the bench nearer the half of the pitch their team is defending at the time. How big should the safety zone behind the goal lines be? For the players’ safety, the minimum distance between the goal lines and any obstacle is 2 (two) metres. If this is not possible, any obstacle in the zone should be made safe to protect the players. What should the referee do if the ball stops completely and none of the players can find it? Play doesn’t have to be stopped; the referee should move the ball a little so that it begins to make a noise again and the players can find it. If a goalkeeper is sent off, does that team have to play for five minutes without a goalkeeper? the player who was taken off to let the substitute goalkeeper play can come back on. If a team’s two goalkeepers are injured or sent off, what should the referee do? He should allow any of the team officials to play as goalkeeper, provided that official was on the squad list handed in before the match. What is the maximum number of players and officials a team can include in its squad list? A maximum of fourteen people who shall have the following functions: eight outfield players, two goalkeepers, one guide, one coach, one assistant coach and one doctor or physiotherapist. Do goalkeepers have to wear shinguards? Yes. What should the referee wear normally? A jersey or shirt, shorts, socks and shoes. What should the second referee wear normally? A jersey or shirt, shorts, socks and shoes. * When should the timekeeper start the clock? When the referee blows his whistle or when the ball is moved? The timekeeper should start the clock when the ball is moved. Is it a foul if the goalkeeper leaves his area? No, it’s only considered a foul if he participates actively in the match, either physically or verbally, when he is outside his goalkeeper’s area. If he guides when play is outside his third of the field of play it’s also a foul. A goalkeeper takes a goal clearance and the ball goes over the half- way line without touching his half of the field of play. What should happen? Possession is given to the opposing team and an indirect free kick is awarded, to be taken from any point on the half-way line. The goalkeeper picks up the ball when it is in play and throws or kicks it beyond the half-way line without touching his half of the field of play. What is the foul? It’s a personal foul for the goalkeeper and play should be stopped and restarted with an indirect free kick, to be taken from any point on the half-way line. If a goalkeeper’s hand leaves the goalkeeper’s area accidentally during a goal clearance, is it a penalty? If a goalkeeper kicks the ball beyond the half-way line and the ball bounces or touches his half of the field of play and then enters the opposing team’s goal, what should the referee do? He should award a goal clearance to the opposing team. What should the referee do if, as a result of injuries or sending offs, a team is left without guides? a He should allow anyone on the squad list (except B1 players and the team doctor or physiotherapist) to perform the duties of a guide. b He should allow a team to play without guides. If a guide, goalkeeper or coach gives his players instructions outside his third when the ball is out of play, is it a foul? No, but as soon as the referee indicates play should restart none of them can give instructions to his players outside his third. What should the referee do if a substitute, a team official or a guide breaks the laws of the game? If the referee stops play because of this, he should show the person breaking the laws of the game a yellow or red card. This is also an accumulated team foul. Play should be restarted with an indirect free kick (Law 12). If the referee decides to play the advantage, once the ball is out of play he should show the person breaking the laws of the game a yellow or red card. This is also an accumulated team foul. Play should restart according to the laws of the game. If this happens when the ball is out of play, the referee will only show a yellow or red card to the person breaking the laws of the game and play will be restarted according to the laws of the game. Can a goalkeeper take free kicks? No. If, after the third accumulated team foul, the referee awards a free kick closer to the goal than the second penalty spot and the kicker and coach do not agree where it should be taken from, what should the referee do? He will allow the kicker to decide. A penalty is about to be taken from the second penalty spot and one of the kicker’s team-mates breaks the silence. What should the referee do? Play continues. If the infringement is committed by a player, team official or guide from the opposing team and a goal is scored, it stands. If it goes wide or the goalkeeper saves, it should be taken again. Can a goalkeeper take penalty kicks? No. Can a goalkeeper take a kick-in? No. In an official match a goalkeeper leaves the field of play in his run up and takes the goal clearance from inside his area. Is this allowed? No. The goalkeeper must remain inside his area at all times when taking a goal clearance. Can a goalkeeper take corner kicks? No. The Laws of the Game for the B2/B3 category are those of FIFA with the following IBSA adaptations. 1 All efforts should be made to avoid reflections caused by sunlight or artificial light on the field of play as these reflections may adversely affect or limit the match and the players’ movement. 2 Light must be of an equal intensity on all parts of the field of play and during the entire match. Variations in light intensity are prohibited in all circumstances. 3 The ball used in this category may be white, green or orange, or any other colour that might facilitate locating it. 4 Referees must belong to the IBSA Futsal International Referees Pool. 5 Any player who commits 5 (five) personal fouls during the game in progress shall be disqualified and must leave the field of play. He may be substituted immediately by another player. 6 Players classed as B3 shall wear a red armband on their right arm. 7 At all times during the match each team must have at least 2 (two) B2 players on the field of play. * Play shall be stopped. * The player committing the infringement shall be cautioned. * The player committing the infringement shall be ordered to leave the field of play. * Play shall be restarted by means of an indirect free kick from the position where the ball was when play was stopped. 8 Should a B2 player suffer an injury, he must be substituted by another B2 player. If the team has no B2 players to make this substitution, it shall continue the match with 3 (three) outfield players. 9 Goalkeepers may be fully sighted or partially sighted (B2 or B3). 10 The goalkeeper may not leave his penalty area under any circumstances. If the goalkeeper kicks the ball while outside his area, he shall be shown a yellow card and the referee shall award a direct free kick (personal and accumulated foul), to be taken from the place the goalkeeper touched the ball or participated in play, to the opposing team. Should he repeat the infringement, he shall be shown a second yellow card and sent off. Even if the referee decides to apply the advantage rule when there is a clear scoring opportunity, he shall subsequently sanction the goalkeeper committing the offence accordingly and indicate the accumulated foul. 11 If the goalkeeper handles the ball outside his area he shall be shown a red card and sent off, regardless of whether he had previously received a yellow card. 12 The goalkeeper is not allowed to take any type of kick outside his area (penalty kick, etc.) under any circumstances. 13 At a goal clearance, if the goalkeeper throws the ball beyond the half- way line without it touching the goalkeeper’s half, touching any players or leaving the field of play, the opposing team shall be awarded an indirect free kick to be taken from the half-way line. 14 If the goalkeeper throws the ball beyond the half-way line without it touching the goalkeeper’s half, touching any players or leaving the field of play, a personal foul shall be awarded and play shall be restarted with an indirect free kick from the edge of the penalty area at the place closest to where the goalkeeper was when he committed the infringement. The following regulations shall be used at all IBSA-sanctioned competitions and at competitions between two or more IBSA-member organizations. 1.1 Three point for a win. 1.2 One point for a draw. 1.3 No points for a defeat. a) Highest number of points won in all games played. b) Goal difference for all games played. c) Highest number of goals scored in all games played. d) Draw to be made by the organising committee. 2.1 If there is a draw between two teams in different groups who have played a different number of games (if one group has fewer teams than another), the average goal difference for all games played shall be calculated and used. 2.2 If three or more teams having played all their games, have the same number of points, criteria b), c) and d) shall be applied to the three or more teams involved to determine the final standings. a) If the match is a draw after the 50 minutes of play, penalty kicks shall be taken to determine the winner. a) If the match is a draw after the 50 minutes of play, extra-time shall be played. This shall be two equal periods lasting five minutes each. b) If a team has not used its time-out during the second half of normal time, it may do so during extra-time. c) There shall be no break between the two halves of extra-time. d) Personal fouls and accumulated fouls shall continue to be valid. e) If, following extra-time, both teams have scored the same number of goals or neither has scored any goals, penalty kicks shall be taken to determine the winner. h) Doctor or physiotherapist: surname and name. 4.2 Surnames, names and shirt numbers may not be changed at any time during a competition.